The Nashville Predators hit a brick wall on Friday night and could not figure out the Colorado Avalanche. The Preds would go onto to lose by a score of 3-0. This afternoon, the Preds look to get off their losing ways as they take on Patric Hornqvist, and the Pittsburgh Penguins. In their last outing, the Penguins (28-13-8) defeated the New Jersey Devils 2-1 in OT. The 1st goal for Pittsburgh came late in the 3rd period when Chris Kunitz buried one at 16:49. The game winner came at 02:21 of the OT when Simon Despres scored his 2nd of the year. Sidney Crosby currently leads all Penguin scorers with 52 points. Crosby has 15 goals and 37 assists. Evgeni Malkin is right behind Crosby in points with 51. Malkin has 19 goals and 32 assists. Malkin is on the IR with the dreaded lower-body injury. He has been out since January 21st, and he will not play against Nashville. 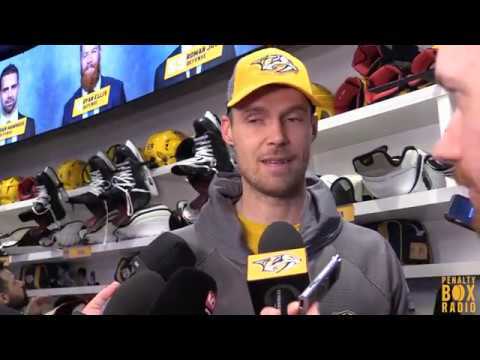 Every day that Pekka Rinne is out makes it more and more obvious that he is a Hart Trophy candidate. The value that he has on his team is evident in his absence. The Preds have struggled without the big man in net. His presence has been a big reason why the organization has struggled as of recent games. It will be good to have him back, upon his return, as long as he is healthy. He does not need to return and risk re-injuring his knee. On October 25th, 2014, the Nashville Predators suffered their 1st loss in regulation in the 2014-15 season to the Pittsburgh Penguins. In that game, the Preds were handily defeated by the Penguins 3-0. Now, with that being said, Nashville will want to avenge that loss and turn around this road trip. The Predators cannot afford another loss. Teams of the Central Division are starting to cut into their lead. If you ask any knowledgeable hockey fan what the Pittsburgh Penguins are known for, you will get one answer… OFFENSE. This team knows how to put the puck into the back of the net. The Preds must have a defensive gem, all around, in order to come out of Pittsburgh with a win. **Another interesting side note is that this will be James Neal‘s return to Pittsburgh. Of course, he was traded for Hornqvist and Nick Spaling. It will be interesting the response he gets from the Penguin faithful. Today, at 1 p.m. CST at Consol Energy Center in Pittsburgh, the Nashville Predators will try to get back on track and take on a team making a run for the playoffs. The game will be shown on FOX Sports Tennessee (pregame at 12:30 a.m. CST) or you can listen live on 102.5 The Game.